Encouraging higher voter turnout, increasing civic engagement and fostering young leaders are challenges many democratic governments face around the world. These topics were discussed among a panel of Bangalore and Australian elected officials to compare and contrast the two decentralized governments and the problems each face. On Thursday June 29th Bangalore’s Political Action Committee (B.PAC) hosted ‘Roles, Responsibilities and Decision Making Processes in a Decentralized Set Up’ a panel that focused on Citizen participation in the electoral process, developing young leaders, decentralization of power, local self-governance and the general election process in both India and Australia. The panel explored the importance of citizens and local groups in the civic space, a keystone in B.PAC’s mission for citizen engagement and better governance. Panelists from Bangalore included Rajya Sabha MP Prof. Rajeev Gowda, MLA N.A. Haris, MLA Dr. C.N. Ashwathnarayan and national spokesperson of JD-S Tanveer Ahmed. Australian delegates included Deputy Convener of Multicultural Labor Palani Thevar, MLC Dr. Sally Talbot WA State Parliamentary Secretary to the Minister for the Environment and Climate Change, Member of Saderson Kate Worden, Director of Aboriginal Catholic Ministry Vicky Burrows and others. 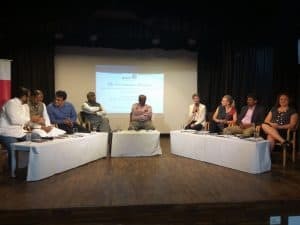 The panel, which focused largely on Bangalore’s local government, did not include anyone from the BBMP, the city corporation. The participants discussed how a decentralized government system helps delegate decision making power on issues directly concerning each tier of government. The panel pointed out civic engagement is key to encouraging elected officials to make decisions based on citizen priorities. Involving local organizations and civic bodies better communicates the needs of citizens to decision makers. Voting turnout is an essential part of civic engagement. According to statistics stated during the panel the average voting rate in Australia is 88 percent, while in Bangalore the voting turnout for the 2015 general elections was 54 percent and less than 50 percent for the BBMP elections that same year. Australia employs a compulsory or enforced voting system that requires citizens to participate in the democratic election process, whereas voting in India is optional. In response to Australia’s compulsory voting method, N A Haris commented that the compulsory voting can be effective if voters are given benefits for voting. In Australia, eligible citizens are required to register to vote and are given a penalty if they do not vote in an official election. Although the voting turnout is higher, Australian panelists discussed the difficulty of encouraging young voters to cast a ballot, something that candidates focus on improving every election year. Panelists from both countries agreed that encouraging young people to vote is essential and a continued effort to improve their turnout rates. Bangalore’s officials too discussed how to encourage the younger generation to take an interest in local government and foster future leaders. It’s no surprise that developing the next generation of leaders is a priority. Efforts to increase engagement among all sectors of the city, increase voter turnout and political participation are important steps to creating a more comprehensive decentralized system in Bangalore and a blueprint for future leaders. But how will Bangalore achieve this? As a citizen of neither India or Australia, and one of a country that is not considered fully decentralized I was an outsider looking in. Living in the United States I am all too familiar with topics of voter turnout, citizen engagement and delegation of local power. B.PAC and the panelists’ push to engage younger leaders and to strengthen local bodies is a call heard in most democratic states. I was interested in learning how Bangalore and Australia are working to fix these problems. Aside from understanding the structure of local and state governments in a decentralized system and the differences in voting methods between India and Australia, the actual solutions fell short. I heard a lot about the importance of local bodies and increasing civic engagement, a battle cry for citizens and local groups to get become involved. It’s similar to what I hear back home all the time, if you want something to change you have to make your voice heard. While that’s all good and true, it’s not necessarily a solution. Compare and contrasting the issues of civic engagement in India and Australia is not problem solving. Pointing fingers at local bodies for not asserting their power is not effectively delegating power to the municipality. A main point discussed was relating to younger voters, the trials of encouraging them to vote and get involved in leadership in both countries. As a young voter I have felt the push to get involved in politics, to make my voice heard, to someone trying to relate to me. I do believe fostering the younger generation of leaders is a top priority, but again focusing on the struggle to connect is not actively solving the problem. I walked out of this panel with the understanding of the Indian and Australian government structures, I did not walk out enlightened of tactics being employed on the ground to increase involvement of local bodies and young voters. 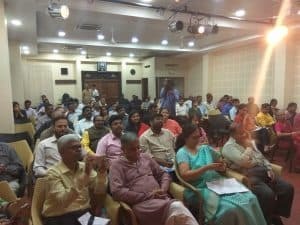 I left with the questions: How will Bengaluru delegate more power to local bodies? How will the state and central governments encourage civic engagement? How will India increase voter turnout and target young voters?